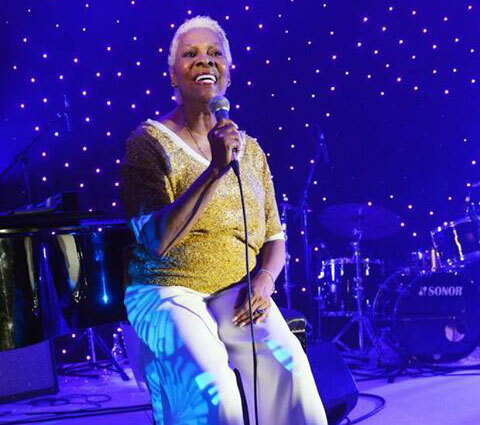 Singer Dionne Warwick, one of the best-selling acts of all time, recently returned to the Philippines for another major concert series. Wooing old school fans, she performed three times: in the capital city of Manila at the Manila Hotel Tent on July 20th, at the SMX Convention Center in Davao City on July 21st, and again on July 23rd in Manila at the Smart Araneta Coliseum. She was presented by Ovation Productions, who decided to bring her back after highly successful concert series in 2010, during which she performed to sold-out crowds in Manila and Cebu. Warwick, who is the cousin of the late Whitney Houston, is known for her chart-topping hits such as Walk On By, Do You Know The Way To San Jose?, I Say A Little Prayer and I’ll Never Fall In Love Again. 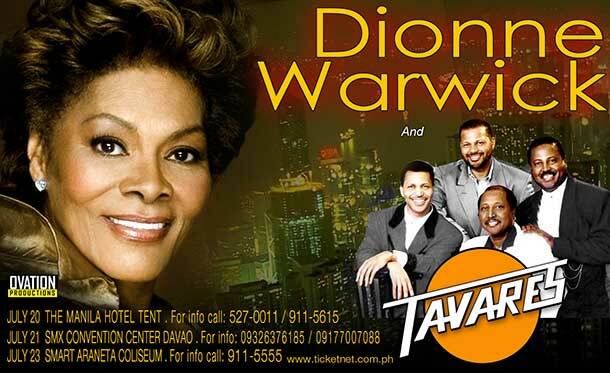 Also performing with her in the Philippines, was Tavares, an American R&B, funk and soul music group that was popular in the 1970's and 1980's. They were the show’s opening act. They are best known for their hit songs It Only Takes a Minute, Heaven Must Be Missing an Angel, Don't Take Away the Music, and their rendition of the Bee Gees song More Than a Woman.